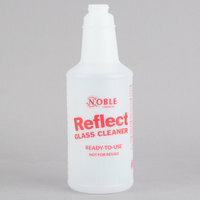 Bulk spray bottles from Noble Chemical are ideal for the janitorial tasks in your restaurant, hotel, hospital, office building, or other business. 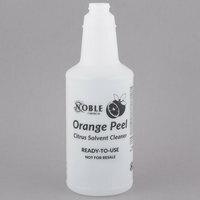 Many of these bottles come labeled and are designated to hold certain chemicals, including degreasers, sanitizers, glass cleaners, and detergents, to prevent mixing chemicals. 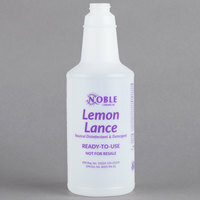 You’ll also find items that are meant to hold all-purpose cleaners for your everyday needs. 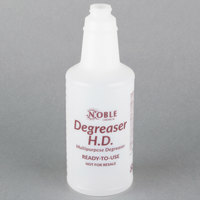 Also make sure to check out other great items from Noble Chemical, Continental, Devault Enterprises, Unger and WD-40. 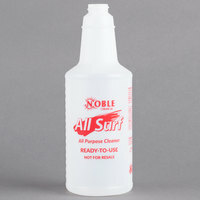 Our selection of Noble Chemical bulk spray bottles are compatible with various nozzles that make it easy for users to spray contents on countertops, windows, dining tables, and bathroom sinks. 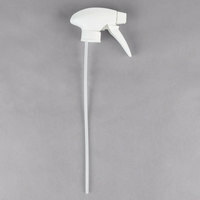 Many of these sprayers can also be adjusted to dispense chemicals in a spray, foam, mist, or steady stream form. 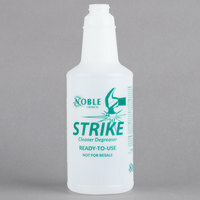 As an added bonus, these nozzles have leak-proof designs that prevent messes and spills. For other great cleaning supplies for your establishment, check out our janitor carts, pails, and microfiber cleaning products. 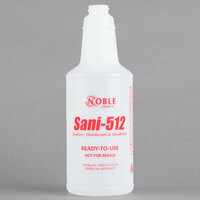 If you're wondering where to buy noble chemical bottles and sprayers, we have a large selection of noble chemical bottles and sprayers for sale at the lowest prices.